Joseph Vining, the earliest discovered ancestor of this line, was born 22 Apr 1780 in Hartford, Connecticut. 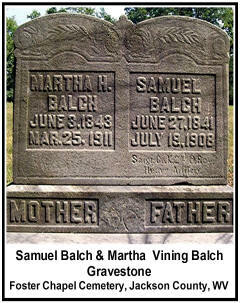 He died 15 Mar 1870 in Meigs County, Ohio and is buried in Howell Hill Cemetery in Meigs County. It is believed that Joseph had at least 3 brothers and 1 sister, all born to unknown parents. The theory is that his siblings were: Joshua/Josiah, Samuel, Richard, and Phebe. "In 1810 Joseph Vining and his brother, Joshua Vining, came with their families from Hartford, Conn., and settled in Rutland township, near the later residence of John B. Bradford. 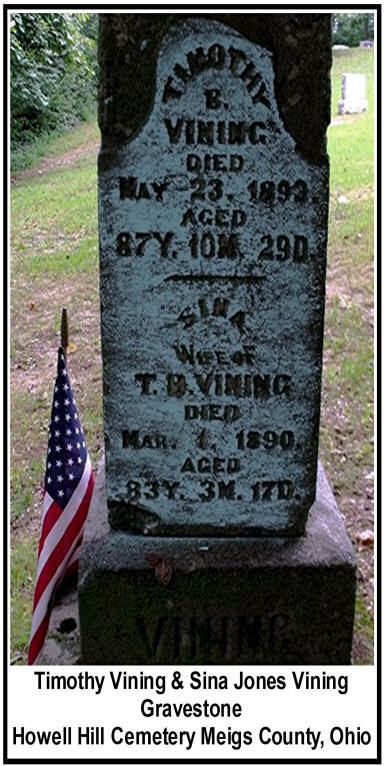 Timothy Vining, a son of Joseph Vining, was born in Hartford July 24th, 1805. 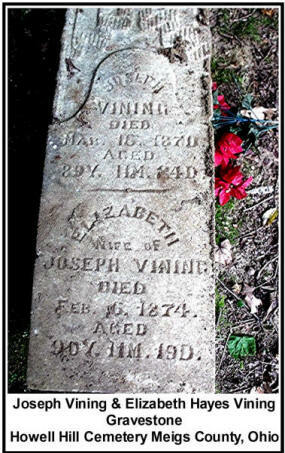 Joseph Vining died at the age of ninety-one years, and his wife near ninety years. 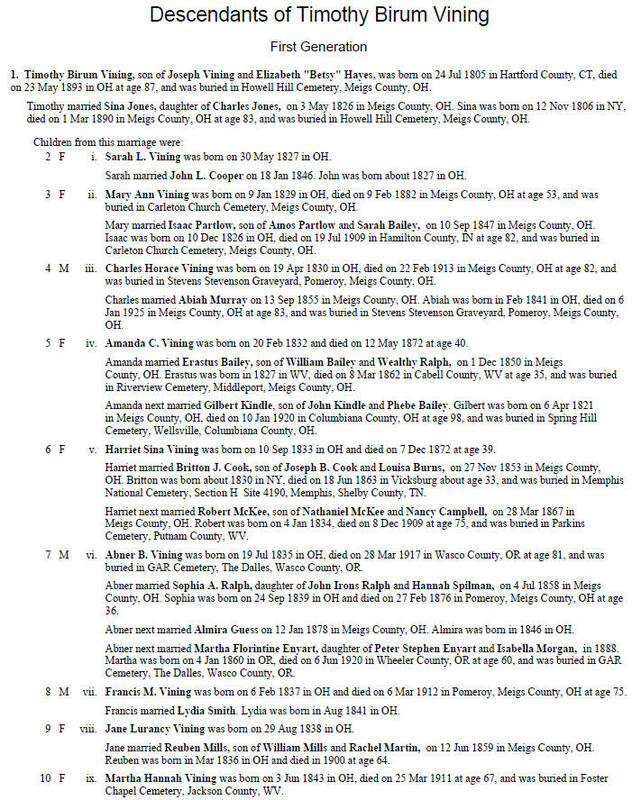 Timothy Vining married Sina Jones, daughter of Charles Jones, and they had a large family-six sons and three daughters. The six sons were all soldiers for their country. Mr. Vining died at the age of eighty-seven years ten months and twenty-eight days on May 23rd, 1893. Mrs. Sina Vining died at the age of eighty-four years." Per the 1790 U.S. Census, there are 2 VINING families living in Hartford County, Connecticut. Richard Vining lived in Granby, Hartford County, Connecticut and listed 3 males under the age of 16 in the household. Alexander Vining lived in East Windsor, Hartford, Connecticut and listed 5 males under the age of 16. It is possible that Richard or Alexander is the father of Joseph and Joshua Vining. 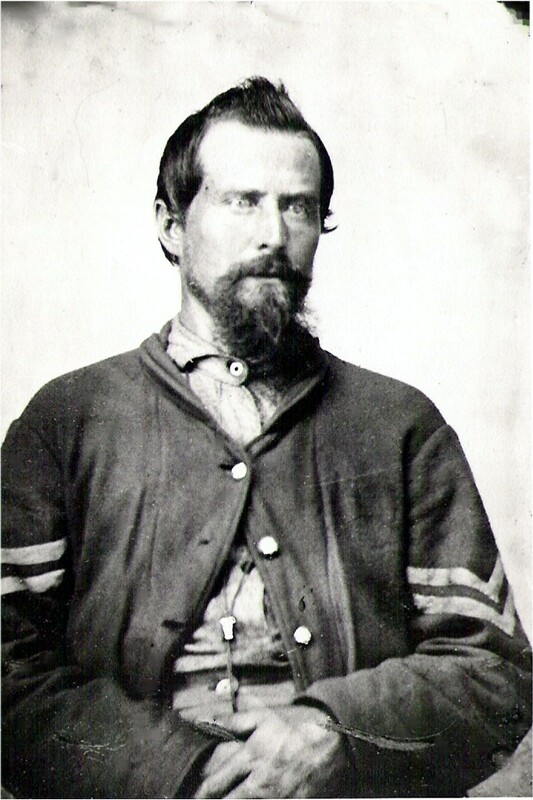 Since Joseph Vining married Betsy Hayes in Granby, Hartford County, Connecticut, it is probable that Richard Vining is Joseph's father. 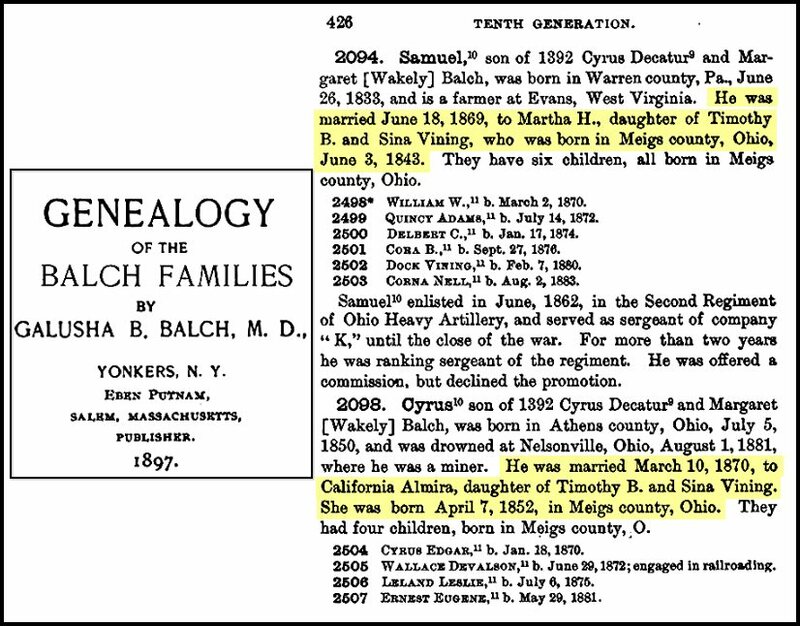 Two of Timothy and Betsy Vining's daughters, Martha and California, married into the Balch family. Timothy and Sina Vining's 5th child, Harriet Sina Vining, was born 10 Sep 1833. Harriet married Britton J. Cook, who was wounded, taken prisoner by the Confederate Army and died in captivity in 1863 during the Civil War. In 1867, Harriet married Robert McKee. Harriet died on 7 Dec 1872. After her father, Britton Cook, was killed in the Civil War, Addie Cook traveled west with the Stephen and Carrie Hooper family and worked as their housekeeper. Per the 1900 U.S. Census, Addie and the Hooper family lived in Jackson County, Missouri. Addie is listed as a boarder, 45 years old and born in in Ohio in Sep 1854. After a few years in Missouri, the Hooper family moved to California and Addie went with them. Addie never married. In June 1903, according to the Sitka, Alaska Death Register, Harvey had moved to Sitka, Alaska. Per the 1910 U.S. Census, James Harvey Cook resided in Skagway, Alaska Territory. He is listed as Harvey Cook, at age 47, born in Ohio and working as a Capenter. Per the 1930 U.S. Census, James Harvey Cook resided in Skagway, First Judical District, Alaska Territory. He is listed as Harvey Cook, age 66, born in Ohio, and working a a carpenter in his own shop. 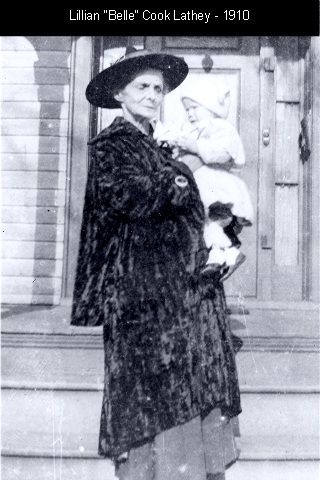 Six months before his death, Harvey entered the Sitka Pioneers' Home. Click on the following link to view information on the descendants of Joseph Vining to the present. This report was generated by the Legacy Genealogy program. (Report with documentation also available). Vining Family Descendant Book (1780 - Present) - a privatized (dates & places of living people omitted) 10 Generation Descendant Book (PDF), starting with Joseph Vining - 30 pages plus index.